Ready to play a few strings? But you may want to take a piece of this $508 million dollar piece that has everyone playing tunes for. People are literally spending millions every year to learn how to play the guitar. The Learn Guitar niche is huge and it's only growing so why not get involved here? We'll be dissecting this multi-million dollar niche apart and show you where and how the money can be made, what solutions are readily available and where you can find your audience. Luckily for you, in this report we're going to jump into the Learn Guitar niche and show you where and how the money can be made. Combined they add up to an over 268,800 searches a month and that's not including the thousands of long tail keywords that we haven't covered. How did jimmypage learn his guitar? When did Elvis learn how to play the guitar? Should you learn the bass or the guitar? How can you learn guitar fast? Are Austin guitars good to learn on? As you can see people are searching for everything from the Learn Guitar journey in the niche. 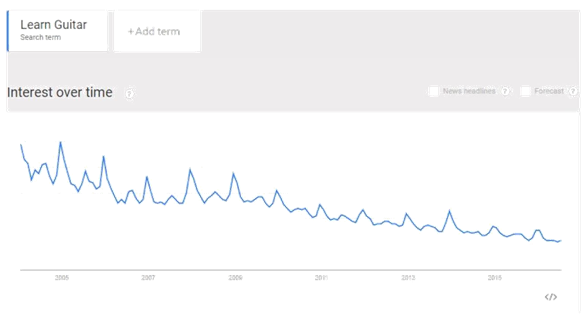 Look at the trend in interest in the Learn Guitar niche. It is still relatively popular and is predicted to remain so for years to come. This Niche was very popular a couple of years ago and has remained relevant for more than a decade. This is because music industry became blend of various instruments and lots of blended musical gadgets take place over classical instruments. As you can see people excited and motivated to share content such as learning guitar and guitar essentials in this niche. These are the 5 most influential people in the market niche on learn guitar. The types of items you can market to learn guitar Niche is apparent when you look at the offerings online. People are looking for guitar books, online learn guitar, learn guitar chords etc. Amazon has over 8,841 products listed, ranging from just zero to Hundred dollars. There are over 68 products related to the topic on CB. Incorporate these items from Clickbank to maximize profits. There are many retailer on CJ.com with affiliate programs related to learn guitar. Google blog search shows almost 2,030,000 pages, so there's no shortage of content ideas and bloggers to network with. These are some of the top forums catering to Learn Guitar. Facebook has tens of 1000’s of people interested in learn guitar. It's a great place to network, advertise, get traffic, meet others in the niche and more. Learning guitar is often cited as a form of relaxation for many people because of the therapeutic nature of the instrument. Learning guitar can have a profound impact on peoples’ confidence, which can make big changes in personal life. People want fame and rich; learning guitar is the most popular way to achieve all those rewards. Playing guitar sharpens brain cell and able to give more concentration. To become a professional performer. It will help to play any kind of music genres: jazz, blues, classical, rock, metal, pop, etc. It teaches self-discipline and perseverance. Learning guitar is an alternative to the sporting life. Learn to play guitar give serious pleasure and act as a trigger to release of dopamine in the brain. It helps to relief stress, anxiety, and depression. Learning guitar makes people intelligent, creative, confident, attractive, and sensual. Learning guitar helps to understands what really makes the music. Learning guitar can help to create new band group, popular music, and songs which will give celebrity image. How to start learning guitar? What are the common books for learning guitar? How to start online guitar learning? How to play acoustic guitar? What are the basics to learn guitar? Learn The Guitar (free) - This Simple Trick Makes It Easy Play Your First Song in 15 Minutes. Learn To Play Guitar Learn to Play Guitar Right Away. Quality Lessons - by Gibson Guitar! Beginner Guitar Lessons - Great online videos to learn guitar Top-Class Expert Instructors. Learn Guitar is steady market and is highly profitable. It's worth $508 million so now is the perfect time to get involved. Over 268,800 people are searching for just the most obvious keywords every month – showing huge online demand. The target audience is both male and female aged 20 to 24 tend to have disposable income to spend – you can benefit from that spending. Between the social media hubs and forums there's around 3,020 members meaning a huge pool of engaged traffic to tap into. There's an endless array of content ideas in the niche including popular ones like “learning acoustic guitar” and “learn guitar to play music” – create similar content but better and it's almost guaranteed to go viral. People are passionate about this topic and ready to spend money, you can see they already buy Guitar Learning Materials and Lean guitar books it may as well be spent with you. There's endless problems from how to play lead guitar to different chords of guitar and every problem as a product available which solves it – sell these as an affiliate. There's plenty of good domain names available including getguitar.net and childrenlearnguitar.com – pick one and get started. Learn To Play Guitar and Free Guitar Chord Chart or Learn To Play The Guitar - All Levels & Styles are advertising in this niche showing it must be profitable, people don't spend money on ads if they can't profit from them – get involved. You can have an up-to-date and relevant authority site on Learn Guitar. You get your content ideas from seeing what's popular on other Learn Guitar blogs and related blogs and simply write something bigger and better, bolder and stronger. Make the other ones pale in comparison. Do you know where the solar & fitness niche report can be located? Looks like a great niche to get into. What do you think is the best way to drive traffic to our sites? Yeah it does look like a fantastic niche. Traffic is the same for every site / niche. Work out WHO your target audience is then where they hang out online (or offline) and then have a presence there. Get your content and / or ads on all those places and find ways to funnel those people to your own site. It's all about leveraging other peoples audience to drive their traffic to your site. It could be through guest posts, blog commenting, forum marketing, content syndication, networking with others in the niche so they feature you in posts, social media marketing, banner ads, PPC, solo ads etc. When you find a traffic source that works and converts then scale it up where possible. Networking is a big one for me. By interacting with other bloggers, linking to them, sharing their content, featuring them in expert round ups and so on they often return the favor. Yes, I have been a player for many years and have always wanted to set up an 'authority site' or online magazine style site - I made the start round Christmas time but need to add more content and my own types of lessons - good call! The links for the guitar website package are invalid. I use this site quite often, but I am finding in the information is outdated and links are invalid. Makes me question the validity of this site. Hey Lori, it's an old post. Things on the internet change. Links are no longer relevant. It's impossible for a webmaster to check every link on his site on a regular basis to make sure it's still live. Especially when there's as much content as we have on NH.